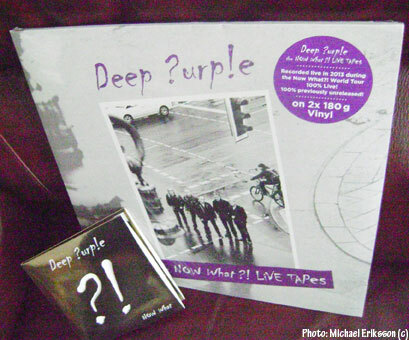 It has been a remarkably good year for Deep Purple and the record company is now quick to capitalise on the success with a Golden Edition of “Now What? !” that includes a couple of bonus tracks and a live CD called “The Now What?! Live Tapes” recorded in Italy, Denmark and Sweden. The live set has also been released as a double LP, which is very nice. Of course, I can never get rid of the plastic on the LP because I will lose the sticker if I do. Darn it. Would it kill them to put the stickers on the actual cover? In any case, the live set is quite good (although it should have kicked off with “Hard Loving Man” rather than the slightly boring “Strange Kind of Woman”, the only dud on the record). I have listened to it a few times and it really is quite listenable. Last news from the band seems to suggest more gigs in 2014 followed by another visit into a studio at the tail end of next year, possibly to gear up for the next album (the twentieth). I hope they do, time is running out fast. As it stands, they have every opportunity to end this with a great period. 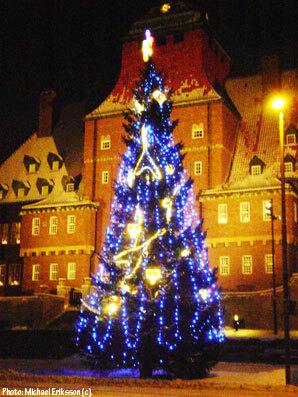 Why, it´s the Michael Mojo Nilsson Christmas tree, standing outside City Hall in Östersund (Jämtland county, Sweden). Decorated with great taste (flying V guitars and skulls, etc), it is the talk of the town right now. Mojo is a well known local guitarist (and no stranger to this blog), so this is highly appropriate. Swedes love to chat about things that are safe to debate, and this year´s Christmas tree is such a thing. Me, I am all for some rock´n´roll, always. 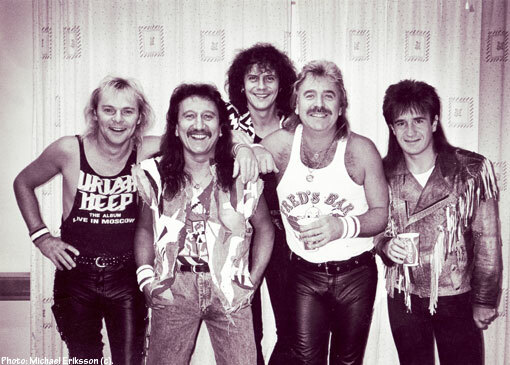 Bernie Shaw (vocals), Mick Box (guitar), Phil Lanzon (keyboards), Lee Kerslake (drums) and Trevor Bolder (bass). The band was promoting “Live In Moscow” at the time, and three of these guys are still in the band – Bernie, Mick and Phil. Lee retired in 2007 for health reasons and Trevor passed away on May 21 this year from cancer. I have seen Uriah Heep open up for Deep Purple since then and I think they are in excellent form – I like the fact that they soldier on no matter what. This shot will be published in RETROFUTURE 7 next year.